Let’s start off this conversation by understanding that the practice of cultivating and consuming tea is an ancient practice that has been adopted and expanded by countries across the globe. The term tea itself has a number of connotations, sometimes referring specifically to the plant itself, but other times as an umbrella term for a beverage, meal service, agricultural product, art, religion, or dedicated pastime (reference). The earliest introduction of tea to western culture was through China in the 1800’s, which also led to the birth of Orientalism due to the general lack of knowledge around Eastern culture, as well as a fixation with the “exotic” nature of their art, culture, beauty, food, architecture, and of course, spices. The teas we are discussing here do not originate in China, though it is always important to understand the greater context of the ritual of tea and our history with it. The two teas we will be focusing on today are Matcha, and Mate (Yerba Mate), both highly prized for their nutrition, and popular today, we will look into their origins, harvest & processing, as well as consumption and nutrition. The Japanese Tea ceremony, also known as Cha-No-Yu, has been a cultural practice for over 400 years, it is a very strict and practiced ritual, and is still practiced in contemporary society by individuals of all classes and social statuses, guided by individuals known as Chajin, or Tea Men. Matcha is the tea consumed in this ancient ritual, so you can say that, in a way, matcha has defined Japanese tea cultures. Since it is so widely practiced, its influence has permeated almost every aspect of Japanese society and has been critical in forming taste habits across the country. 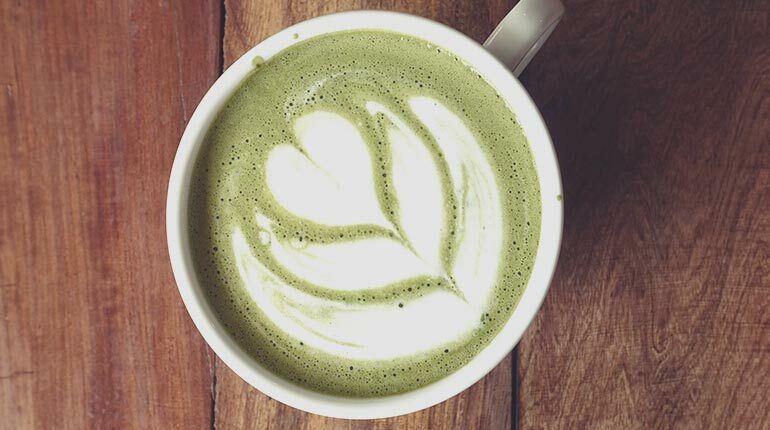 Today, matcha is used outside of just the tea ceremony, and has found its way into the kitchen and created a new niche in the culinary industry for cooking with tea. Matcha is only grown in Japan, and is still farmed and cultivated using ancient traditions to ensure it retains its unique flavor and full range of health benefits. Matcha is harvested in Spring, and weeks before it is set to be processed, the tea is covered in bamboo mats or tarps to reduce the amount of sunlight that reaches it, enhancing the chlorophyll content, as well as the amount of amino acids, deepening the color of the tea, which is where you get the striking green we see in the finished product. The tea is then dried, then destemmed and separated from the vine, at this stage it is referred to as tencha – the precursor to matcha. The tencha is then stone ground where it becomes the matcha we know and love. There are varying grades of matcha, ranging from kitchen grade to ceremony grade, so it can be utilized for a multitude of purposes at the highest quality possible while retaining as many nutritional benefits as possible. The health benefits of matcha are pretty incredible, and because you are drinking the entire stone-ground leaf, you are receiving 100% of the nutrition from the plant. In comparison to other teas, the entire green tea family, but especially matcha, is packed with antioxidants, mainly attributed to catechins EGCG and EGC. It has been scientifically proven that EGCG has anti carcinogenic properties and has been shown to inhibit the growth of a variety of human cancers including; skin cancer, lung cancer, liver cancer and fibrosis, pancreatic and bladder cancer, hepatoma cells, prostate carcinoma, breast cancer, and myeloid leukemia cells. Matcha is also proven to aid in weight loss, thanks to EGCG by inhibiting COMT – stimulating a process called thermo-genesis which is the factor that allows for increased metabolic activity thus weight loss. Other health benefits include, natural detoxification, increased bone density, mood and concentration enhancement, anti-inflammatory properties, and high mineral content including but not limited to; vitamin C, selenium, chromium, zinc and magnesium. There are so many sources to research the additional qualities, applications and benefits of matcha, but it could take a whole book so I will leave you to explore additionally on your own. Across the globe, another ancient tea has been thriving culturally and expanding its influence to the Western World. Yerba Mate, a South American rainforest tree that belongs to the holly family (yes, like that holly), is prized its evergreen leaves that comprise the tea that is most common to us. It was initially harvested by the Guarani people, indigenous to the region. The first records of Mate trace it back to Paraguay, where it was initially domesticated (not without putting up a fight), and eventually cultivated and consumed throughout Argentina, Uruguay, as well as Brazil, Bolivia and Chile. It also reached as far as communities in Syria, Lebanon, where it was imported after globalization had given rise to new markets. The Guarani people traditionally consumed mate in a gourd, in a ceremony of hospitality where the participants pass around the gourd and tea, consuming and sharing the energy of their fellow drinkers. Despite the tradition of ceremony, and not unlike contemporary applications of Matcha, mate can be prepared a number of ways, ranging from your standard tea-bag to an espresso machine, hot or cold. Also like matcha, it is highly prized for its vitamins, minerals, amino acids, and high antioxidant count. Mate also contains a significant amount of caffeine, theophylline, and theobromine, the compounds found in tea, coffee, and chocolate, with an extremely low tannin content meaning it won’t get super bitter and also contains less oils than coffee, so it won’t upset your stomach. 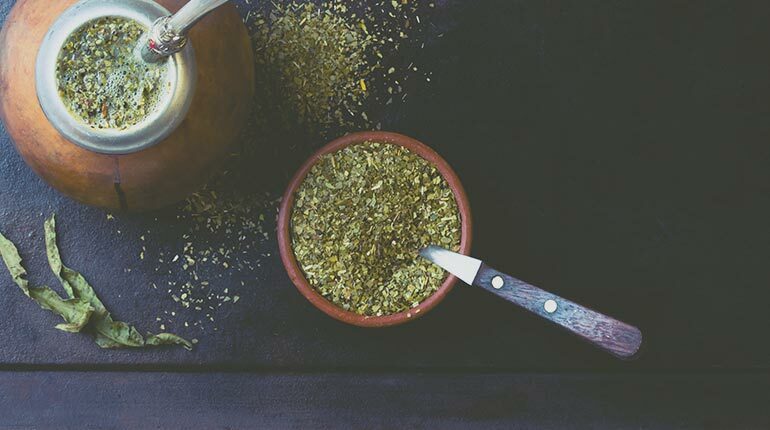 There has been some controversy over the processing of Yerba Mate, which has historically involved a heavy smoke-drying method that dries the leaves over an 18-24 hour period. This method is known to create PAHs (Polycyclic Aromatic Hydrocarbons), that are carcinogenic at high levels. PAH’s are more common than we would like to think, and also find their way into other beverages such as coffee and other teas. There are organic, air-dried varieties available now that boast a significantly lower PAH level, and overall, if you drive a car or live in a city you’re getting exposed to higher amounts everyday so this really isn’t a major cause for concern (in our opinion). Now go, and drink to your health and happiness! Cheers.